Burek – Forget about your diet! Like for many people in Zagreb, burek is one of my favorite local foods. And the best one in Zagreb is made in a place appropriately named Burek. Saturday means shopping for fresh fruit & vegetables at Dolac market, which make me hungry. Burek, located right under Dolac attracts me every time with the smell of freshly made burek. This street food has is origins in Turkish börek and in this area it dates all the way back to the late 15th century. Burek is a place that hasn’t changed much in decades. They did replace old tiles with newer materials, but the kitchen, the taste and the soul of the place have remained the same. Only the two nice ladies working there look a little older, but they’ve been there as well since I can remember. Eating at Burek is as simple as the dish itself. The choice is between meat and cheese stuffing in pastry pie. Order is to go or eat there. Sugar for those who like their cheese burek sweet and glasses of water are free. There are no meat ones left after noon, and that’s why I always try to come before then, because the meat burek is worth coming for early. Burek in Burek is a dish ruining my and my friends’ diets since always. 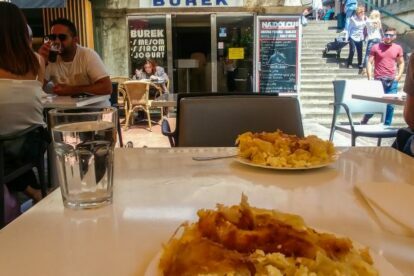 A lot of places in the region have good burek and I like to try it everywhere I go, especially in Bosnia. But when at home, Burek is the best!